The crowd assembles at the Nordic Embassies in Berlin. After two years away from the German capital, Music & Literature returned to Berlin on 24 January 2015 for the first of the fifth issue’s European launches. The Felleshus auditorium of the Nordic Embassies provided a fitting home for the celebration of Norwegian writer Stig Sæterbakken and Finnish composer Kaija Saariaho; the third artist featured in the volume, Chinese author Can Xue, proved no less complementary on this evening of lively, enigmatic music and thoughtful readings. The Felleshus auditorium proved true to its name (“a house for all” in Danish), with as many distinguished guests to be found in the audience as on stage. Editors, publishers, translators, artists, poets, and novelists came together from several corners of the world, joining friends of the issue’s contributors and of Music & Literature as well. László Krasznahorkai and Max Neumann, two of the stars of M&L no. 2, were in attendance, as were several members of Vagant, the Norwegian-language magazine based in Berlin that has been a partner of M&L since our founding. Camilla Hoitenga performs Mirrors (I) for bass flute and cello. Most Music & Literature events have begun unobtrusively, announced by music rather than by words, and Berlin was no exception. Without introduction, but effortlessly commanding the attention of the room, Camilla Hoitenga and Anssi Karttunen performed Kaija Saariaho’s Mirrors (I), a duet for flute and cello. Both musicians are longtime friends and collaborators of Saariaho’s, and their intimacy with the music was evident. It arose very naturally; in fact, they hardly looked at each other during their performances, but appeared to have reached a point of such identification with the music that eye contact became unnecessary. Daniel Medin introduces Music & Literature. Music was never absent for long. After a few words of welcome from Minister Counsellor Mr. Asbjørn Brandsrud of the Royal Norwegian Embassy and program notes by M&L co-editor Daniel Medin, cellist Anssi Karttunen took the stage again for the extraordinary solo piece Dreaming Chaconne (with Colombi). He prefaced Saariaho’s variation on one of the earliest known compositions for solo cello with the original that gave it its name, Giuseppe Colombi’s Chiacona per basso solo. Though Saariaho’s presence had already been deeply felt, Stig Sæterbakken was the first artist to be formally commemorated. Introduced by Audun Lindholm, Sæterbakken was then remembered by a number of his friends and former colleagues. This is an author who once wrote that “crying is all that matters,” and yet everyone who talked about him mentioned his laughter — how genuine and contagious it was, how it overwhelmed his entire body. Svein Jarvoll remembers Stig Sæterbakken. Svein Jarvoll, an acclaimed essayist and writer, spoke warmly of both the man and his gifts, even after admitting that his friendship with Sæterbakken had been troubled at times. Jarvoll, like Lindholm, spoke at length about Sæterbakken’s tireless work to promote international writers in Norway, among them Mircea Cărtărescu and Gaétan Soucy. Appropriately, then, the next text was taken from one of Sæterbakken’s tributes to an admired colleague: Daniel Medin read from “Jeder Satz ist ein Ereignis” (“Every Sentence Is an Event”), an essay on Herta Müller. Herdis Eggen enjoys a work by Saariaho. Sæterbakken’s editor of nearly twenty-five years, Herdis Eggen, who provided an contribution to M&L no. 5 about her personal and working relationship with the writer, then said a few words in Norwegian. Although I unfortunately can’t speak the language, I can testify that she had all the Norwegians in the room rolling with laughter. 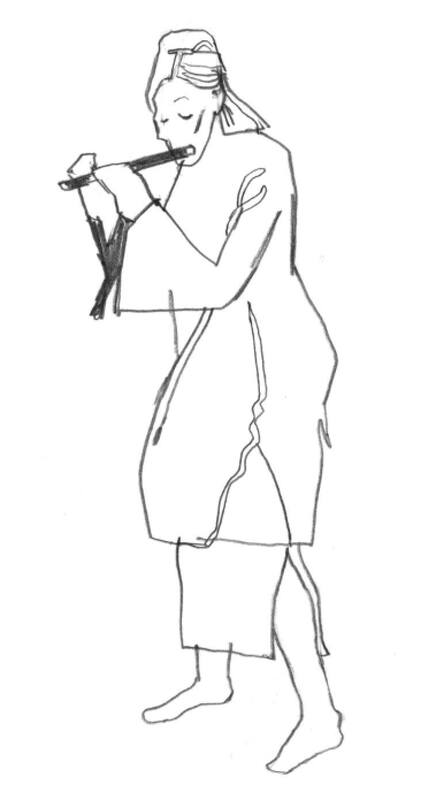 When she was finished, I read an excerpt from Eggen’s piece on the same subject, “Holding Him By the Scruff of His Neck.” Audun Lindholm concluded with “Some Autobiographical Notes,” which also appears in M&L no. 5. By chance, the launch coincided with the third anniversary of Sæterbakken’s death. And while it was clear from his own words and those of his friends that the writer had had many demons to battle, it was also clear how much he was loved and admired. In the end, although I’d never met Sæterbakken myself, I missed him and was sorry he was gone. Several people told me afterwards that they’d felt the same thing. A musical interlude set the stage for the portion of the evening devoted to Kaija Saariaho. Hoitenga and Karttunen returned to play Oi Kuu for flute and cello, before Hoitenga performed Dolce Tormento for solo piccolo. Based on a sonnet by Petrarch, Dolce Tormento requires the flutist not only to coax a wide range of sounds from the piccolo, but also to whisper, hiss, and breathe out words in a kind of aspirated bark. Written specially for Hoitenga in 2004, the piece conveys magnificent tension. 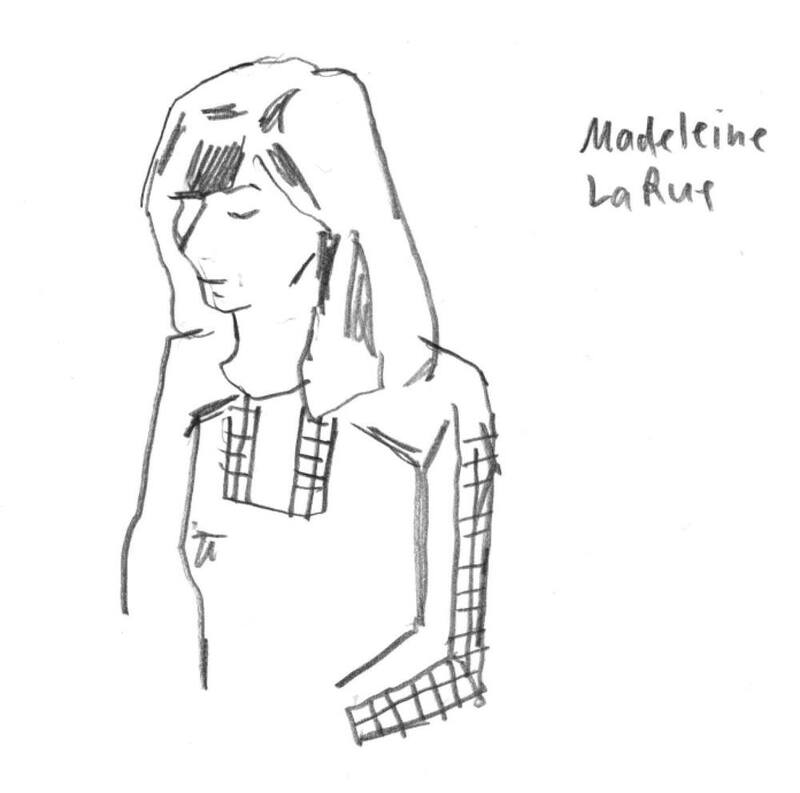 Aurélie Maurin reads Kaija Saariaho. While Saariaho was represented primarily through her music, one of her many texts on the practice of composition, “Musiikissa, musiikista, musiikkiin,” was read out loud as well, in Finnish by Cia Rinne and in German translation by Aurélie Maurin. (The piece appears in M&L no. 5 as “In Music, of Music, toward Music.”) Saariaho herself has written that she has only ever had one desire — “to go back to my music” — and so after the readings, we went back to her music. 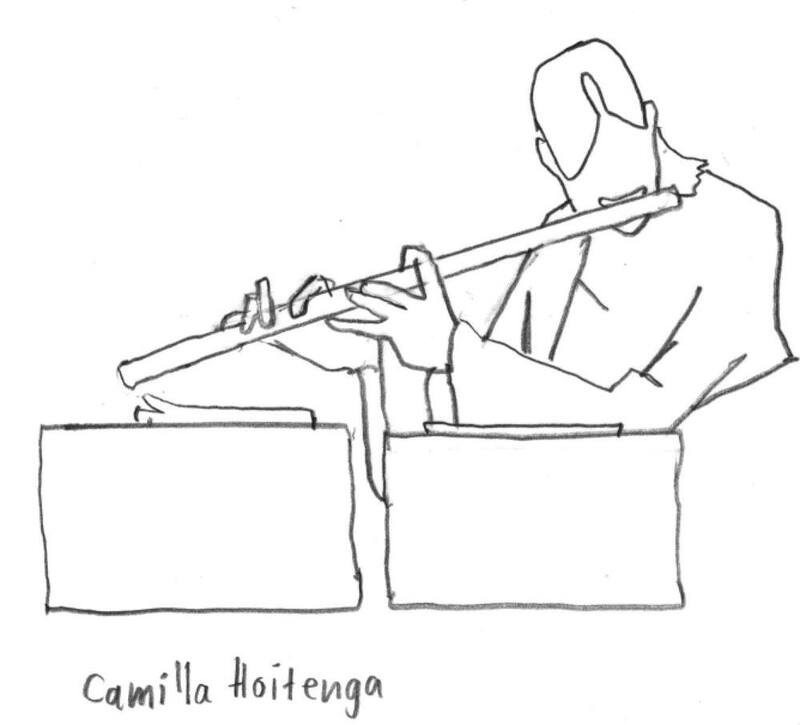 Camilla Hoitenga performed Laconisme de l’aile, an earlier work that also features the flutist’s voice. Cia Rinne recites "Die Hüte auf dem Berg." In her essay “Earth and Air,” Saariaho writes of her discovery that her music was imbued with nature: its silence, its seasons, its smells. The music that followed, Sept Papillions for solo cello, is certainly inspired by nature in its title, but Anssi Karttunen’s performance went beyond that to release, for a moment, the sensation of real butterflies in the air. Anssi Karttunen performs Sept Papillons. Only a few more words remained to be said — Daniel Medin read the Icelandic writer Sjón’s “acta poetica,” a poem dedicated for Can Xue whose application, he said, was wider. And, at last, the evening ended symmetrically, with Hoitenga and Karttunen’s performance of Saariaho’s Mirrors (II). Both the presenters and the members of the audience lingered for some time after the final note had dissolved into the air, gathering in circles to chat in English, German, Norwegian, Finnish, or occasionally all four at once. And that multilingual conversation has continued, even after the doors of the “house for all” were finally closed for the night: Vagant has provided its own write-up of the launch, available in Norwegian here. And although the celebration and music now moves westward, to M&L’s events in Paris and London, the conversation around these artists will endure — as it does within the pages of the issue — a conversation as long as and as illuminating, I hope, as a white night in the far north.